This drawing depicts a typical garden of rural house in southern China, with dense potted plants and a lake, which is an important element in Chinese gardens. Chen Wenxi was from Guangdong in southern China, but from the late 1940s spent most of their time in Singapore and other parts of Asia. 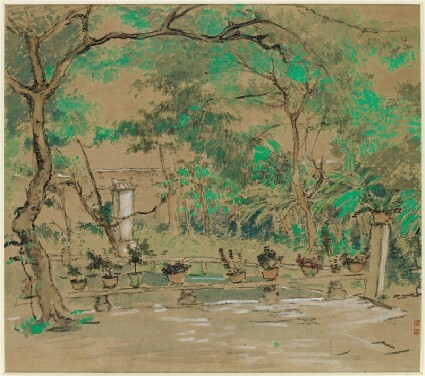 This drawing is dated to the 1950s and may show the artist's reminiscences of his early life in southern China.